Selecting the proper joint size and type is critical! Here at Elev8 Glass Gallery we hear over and over, what size joint do I have? This is a very common question that most every one has at some point in their life. The good news is we have the answers that will help you. 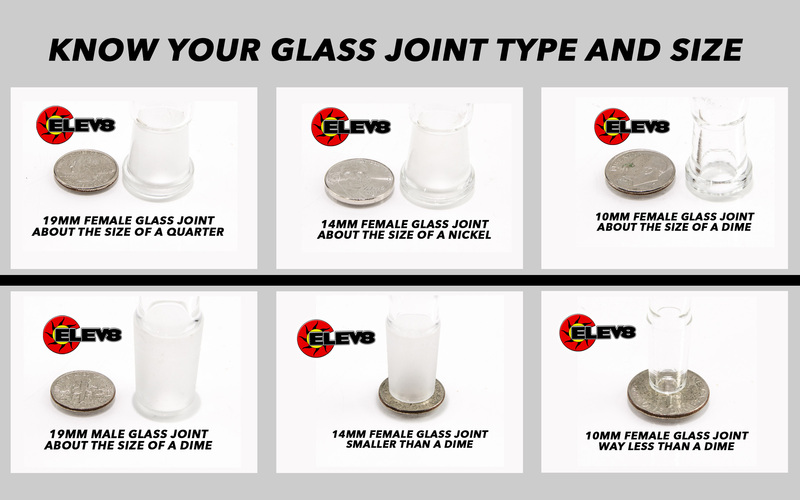 Below is an image that shows a great way to see what size and style joint you have. This is the largest of the standard joint sizes used in the industry. These joints are used on many water pipes that have a downstem. This is so that you can have a nice large downstem and have what we think is the perfect size joint for your bowl. This 19mm male joint fits perfectly with a 19mm male joint. The joint is about the size of a quarter. This is the middle standard female joint size. This is the most common glass joint size for rigs and water pipes that do not have a removable down stem. A 14mm-10mm downstem is what is used in this joint if you have a removable downstem. The joint is about the size of a nickle. This is the baby joint and is mostly used on mini rigs and small water pipes. There is no downstem that can go into this and only works with a 10mm male joint. The joint size is about the size of a dime. Using some coins you might have in your pocket will help easily identify what size joint you have an type. Male joints go into the female joint.